Butter is expensive. But our family really prefers butter over margarine, for several reasons. Butter is also rock-hard fresh out of the fridge. You know what I mean? Like when butter is so hard that it tears up a slice of bread. 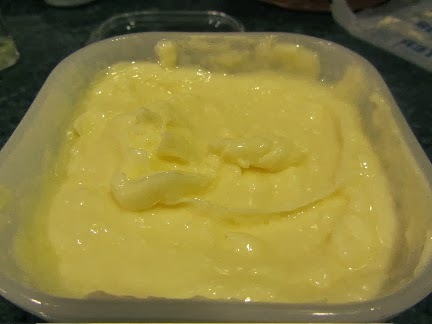 So, to address both problems (expense and spreadability), I make my own soft butter. Our cost for vegetable oil is quite low, about 69 cents per pound, when bought in an institutional-size container (for a post on buying in institutional-size quantities, see here). While real butter is around $1.90 per pound (on sale, and usually limited to one or two pounds, and only with a coupon). By blending vegetable oil into the butter (using about 1/3 cup of oil, for every 1 cup of butter), the cost of my soft butter is about $1.59/lb. I have two methods for making soft butter. The ratios are the same, just a different technique mostly determined by the amount I want to make at one time. The first is a simple process, using a spoon and dish or crock. 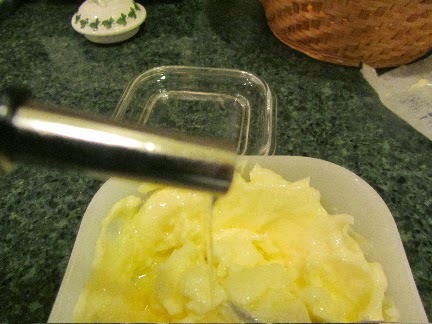 To make soft butter, I soften 2 sticks (1 cup) of butter on the counter for several hours. I mash it up with the back of a spoon, in a small crock, until soft and spreadable. Then I add 1/3 cup of vegetable oil, a tablespoon at a time, mixing in well. When the oil is all mixed in, it looks quite soft and sloppy (and will have some lumps of butter here and there. I'm not a perfectionist about this). I cover and refrigerate. Within a couple of hours in the fridge, it will be firm, but spreadable. 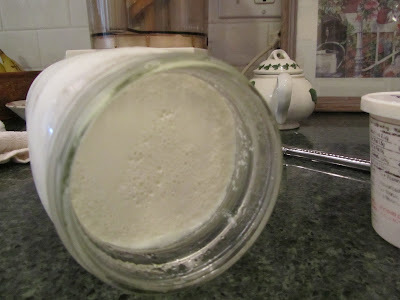 The second method I use when I am making a pound or more of soft butter at a time. I use my hand mixer. I do this just prior to using my mixer to bake a cake or make a batch of cookie dough, and then use that buttery bowl afterwards for the baking batter/dough. Soft butter only takes a few minutes to make, but it really slows our consumption of an expensive ingredient. We do leave butter on the counter quite a lot, without problem. I once read something about listeria and butter, and that leaving it on the counter is not recommended due to the possibility of listeria contamination. But as you've experienced, we have never had that sort of situation. It's cold here, but not a speck of snow, so I feel fortunate. Thank you so much for this post. 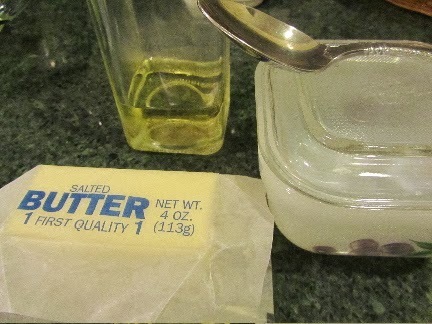 I have been looking for a way to make soft spreadable butter but all the recipes called for much more oil (3/4 c--1 1/2 c). There's only my husband and me and butter left at room temperature goes rancid fairly quickly. That does sound like a lot of oil. My measurements on oil to butter are only approximate. More oil would make the butter even softer, but we seem to like this blend best, as it still tastes like butter. We eat very little butter, so this is usually not a problem for us. As Lisa suggested, I remember when I was growing up, butter was left out all of the time without a problem. How fast it turns may depend on the exact ingredients it was made of. 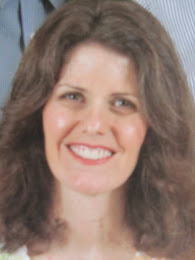 My husband's sister always left the butter in a cupboard. This was a completely unheard of thing to me when we first married. We always kept it in the fridge. Its interesting the different ways of doing things. I use butter more for baking than as a condiment, but there are times when something more spreadable would be nice. Thanks for the idea. Butter really makes baked good taste so much better. I'm thinking in particular about scratch cakes. Years ago, I didn't think it mattered whether I baked with butter or margarine. Then I noticed how much more flavor a cake baked with butter had. 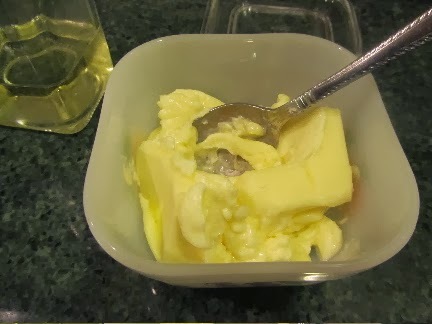 My mom always used half butter, half margarine for baking. That was her compromise for flavor vs cost. What a brilliant idea -- I never thought of that. It would really avoid thick pats of butter on bread. Thanks also for the trip down memory lane -- my mom used to have a dish almost identical to the crock you have the butter in. Oh really! I shop vintage places, and pick up pieces of FireKing Bakeware, when I find them at a good price. They've become trendy, so prices can be high. But I do occasionally find them at a fair price. I do that, though I use canola oil rather than vegetable oil. I like the blends, but got tired of paying for the ready made ones at the store. I use a cup of canola oil to a 1/2 pound of butter. Next time I may try the 1/3 of a cup of oil to see how it turns out. I just use whatever oil I happen to have. Right now its soybean. I've heard of homemade butter blends made with olive oil even. I think the amount of oil is all just preference in spreadability. I like this amount as it's still spreadable, but definitely tastes like butter. I'll have to experiment with more oil, and see how we like it. I take two sticks of softened, salted butter. I gradually beat in 1/2 cup oil using a hand mixer. Then I gradually beat in 1/2 cup water. I haven't tried adding water. That would make it more waistline friendly. I may try that with part of the butter next time. Thanks for the suggestion. I just mixed this up. I usually buy a brand with olive oil, but didn't want to take a chance with something besides a neutral tasting oil. I'll let you know I like it after using. It's great to make something so inexpensively rather than running to the store. Thanks for the recipe!!! Let me know how you like it Valarie! I have made this a couple of times, and love the cost savings. 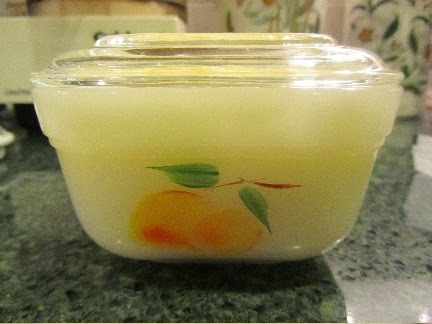 I put it into the tubs of butter/oil spread I used to buy, to help me identify it in the fridge. It is a little harder when it first comes out of the fridge, but softens quickly. Thanks for the great idea!!! Thanks for letting me know how it worked for you. You're right, it is a bit stiffer first out of the fridge than commercial spreadable butter. But as you said, it does soften quickly. I've tried adding even more oil, but didn't like how it worked on things like toast. Carol, I've heard of folks doing this with olive oil, for health reasons, too. I'm glad this will work for you.